Looking for a rich and delicious dessert recipe that tastes like a million bucks but won’t use up all your Points? Try this healthy cupcake recipe for Chocolate Raspberry cupcakes, and you will seriously forget you are on a diet. Made with fresh fruit instead of artificially sweetened syrups and topped with a creamy and flavorful cream cheese frosting, this light cupcake is a real treat. The cake itself is moist and delicious, and the frosting is soooooo yummy, I was tempted to just eat the whole bowl of it with a spoon. Chocolate and raspberry have always been a favorite flavor combination of mine, and using the two of them in this low calorie cupcake recipe turned out oh so good. Though it’s not an official one of WW Dessert Recipes, each of these little decadent cupcakes make the perfect end to any meal, or the perfect Weight Watchers friendly treat to reward yourself with. Enjoy! Indulge in this guilt free Chocolate Raspberry Cupcake Recipe and forget that you are counting Points! Moist, rich, and flavorful, these are the perfect end to any meal. Beat granulated sugar and applesauce in a large mixing bowl with an electric mixer on medium speed until combined. Beat in egg and 1 tsp of the vanilla until well combined. With the mixer on low, alternately mix in the dry ingredients and buttermilk, starting and ending with dry ingredients and scraping the sides of the bowl as needed, until just combined. Fold in chopped raspberries until just combined. Divide the batter among the prepared cups (they will be full). To prepare frosting: Meanwhile, beat cream cheese, remaining tsp of vanilla extract, yogurt, and confectioners’ sugar with an electric mixer until smooth. Refrigerate the frosting until very cold, about 2 hours. 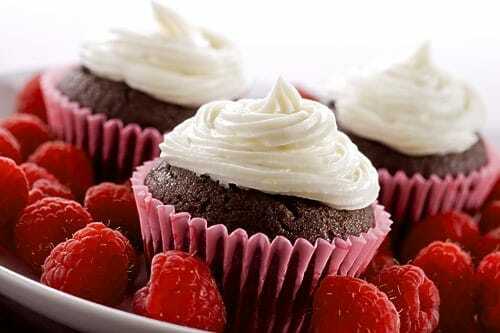 Spread the frosting on the cooled cupcakes and decorate with a fresh raspberry on top. Cupcakes are great tasting. people below must have screwed something up. Plenty of chocolate taste and bits of raspberry were delicious. However they do not last long before they start to get tough on the edges. These are the worst cardboard tasting cupcakes I've ever had. They get chewy on the outside and the whole wheat flour makes them taste horrible…will NEVER EVER make these again! No wonder you only have one comment- you delete all the bad ones. This comment is probably from you anyway. If you really believe the recipe is good you would keep up all the comments and stand by it anyway. This recipe was terrible and I can't believe you took down the bad comment. I will never trust your recipes or visit this site again and will tell everyone I know how bad it is!!!!!!!!! No comments are ever deleted….they are just reviewed first to check for spam. I made this recipe tonight and the cupcakes looked promising – they rose in the oven and looked great! …But then we tasted them. They had a disappointing taste, not very chocolatety and had a strange after taste. This was such a downer after we had just gone out and gotten all the ingredients. Will not be making this again. Thank you so much for all of your wonderful WW recipes!!!! I really appreciate the time that goes into the posting of each one. I have made several of your recipes and served them at dinner parties. No one cares that they are low calorie. In fact, they would never know, if I didn't tell them. I just wanted to say a big THANK YOU to you for your wonderful blog and for you always having a great recipe for all of us who are losing weight on WW!! !